12/1/12 Leigh-on-Sea to London Fenchurch Street and return. Went up to Liverpool and York with my wife for a weekend away. No real problems for a change and for once as I got to the reserved seats at Euston, they were actually facing forwards! You do notice with the Virgin Pendelinos how much they jerk every so often, so it really isn't that smooth a ride, in spite of the speed with London to Liverpool in just over two hours. It's nice to see the statues of Ken Dodd and Bessie Braddock on the station concourse at Lime Street station, (mirroring St Pancras?). By the way the tickets were only £15 each all the way from Leigh-on-Sea to Liverpool, which just shows there are bargains out there if you book well enough in advance. 29/1/12 Liverpool Lime Street to York via Manchester Victoria. Got the 11.22 Trans Pennine Express train straight through from Liverpool Lime Street to York. Although we had reserved seats, there were still two students sitting in our seats, who I promptly removed! It was a much smoother journey than yesterday's Virgin Pendilino journey and very picturesque, going through the snow covered Pennines. 30/1/12 York to Leeds. Leeds to Sheffield. Sheffield to London St Pancras. West Ham to Leigh-on-Sea. Got a Cross Country train from York to Leeds for the first part of my journey. It had started at Newcastle and was going all the way to Plymouth. A thought struck me how all Cross Country trains are diesel, yet for a fair proportion of the journey they travel under wires, ie Edinburgh to York/Doncaster. What a pity all that diesel fuel is wasted by not having interchangeable units like Southern have with their Class 319's which can be used either with an overhead pantograph or a third rail pick up. 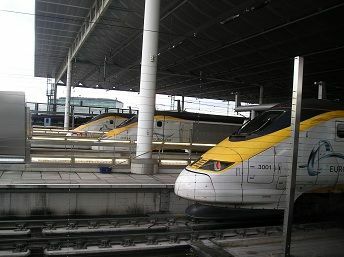 Why not use trains which can be both diesel and electric and thus be more environmentally friendly? The second part of my journey was from Leeds to Sheffield so that I could travel on the short curve into Moorthorpe from the Wakefield to Doncaster line. If I'd known that some Cross Country routes go this way I could've stayed on my train and got home much quicker. Instead I had to make do with a Pacer 142 Class unit which stopped at every station between Leeds and Sheffield! 31/1/12 Leigh-on-Sea to London Fenchurch Street and return. 1/2/12 Leigh-on-Sea to London Fenchurch Street and return. Went to Kings Cross to meet my wife off her train from York. Was away in Kent for a few days break, so managed to fit in a trip on the Kent and East Sussex Railway. It was the first time I had been all the way to Bodiam since the line was extended a few years ago. As it was half term the line was running four trains a day during the week, all steam. For both journeys we were pulled by ex-GWR tank engines. We managed to fit in a visit to the grand Bodiam Castle as well. 15/3/12 - Leigh-on-Sea to London Fenchurch Street. London Euston to Stockport via Crewe. Stockport to Horwich Parkway. Went up to the Manchester area on business and for the first time in over forty years of travelling through London Euston station, I caught a train from platform 18 - the 11.40 to Manchester Piccadilly. This is on the extreme left of the station (facing North) and one part of the station you don't normally see. There was a London Midland train in platform 17 and the other platforms seemed to be hidden from these two. The journey passed without incident and for the the first time in a long while the Pendelino I was on seemed to be more smooth and less jumpy than usual. Perhaps it was because I sat on the right hand side and in a middle carriage. One thing I did notice on this side was the number of freight trains using the West Coast Main Line. 16/3/12 - Horwich Parkway to Manchester Piccadilly. Manchester Piccadilly to Milton Keynesvia Stoke-on-Trent. Bletchley to Bedford. Bedford to London St Pancras. London Fenchurch Street to Leigh-on-Sea. My return journey coming back to Essex was much more eventful. I caught the 12.35 from Manchester Piccadilly and the train was doing fine and was meant to go non-stop to Euston after Stoke, but came to a halt at Milton Keynes. We parked up at platfom 5, next to another Pendelino on platform 4. We waited there for about fifteen minutes before we were told that there had been an incident at Hemel Hempsted. All the time trains were running north as normal. About five minutes later we were told that the train was now terminating here and would be returning back to Manchester. We were told to get off and either wait until the line had cleared or hopefully get on the coaches that were being ordered. I chose to get a taxi to Bletchley as I knew I would be able to get a train across to Bedford and then go onto London from there. Luckily there was only a ten minute wait before the one car class 153 DMU would be leaving. It was very empty, but then a three car London Midland train arrived from Milton Keynes arrived and its 100 plus passengers all made their way onto my train. Obviously someone at Milton Keynes was thinking the same thoughts as me! Of course not every one could get on in spite of the fact that all seats were filled and another twenty were standing. so they had to wait another half hour to the next one. We left on time and stopped at every station. I felt sorry for a chap at Millbrook who had a bike and wasn't allowed to get on the train due to lack of space. Once we arrived at Bedford, we only had a five minute wait before a fast East Midlands train came in. That also was packed and I ended up standing for most of the journey. I eventually arrived back at Leigh-on-Sea about two hours later than scheduled, so I will be contacting Vrigin for compensation. I will keep you posted........... Update. Yes Virgin did pay me compensation for the lost journey time, including my taxi fare, the fare from Bletchley to Befford and the full cost of the single from Manchester to Leigh-on-Sea. It was in the form of a cheque and not rail vouchers, so Virgin have gone up in my estimation! 7/4/12 Holt to Sherringham and return. My wife was visiting a friend in Kings Lynn today, so I had a bit of free time. The choice was either the Mid-Norfolk or the North Norfolk. As there was a choice of only one train with the Mid-Norfolk, whereas the North-Norfolk had a choice of several, I chose the latter. I would have had even longer on the North-Norfolk, but I do not think it was very well sign posted to Holt railway station, and ended up going on a detour through the town of Holt, before eventually finding Holt railway station, which is actually in the village of High Kelling, about a mile east of Holt! Still it was nice to be pulled by 9F 2-10-0 - 92203 Black Prince both ways. On hoilday in Bournemouth for a few days, so decided to visit a new preserved railway, namely the Swanage Railway, so my second steam ride in a week! 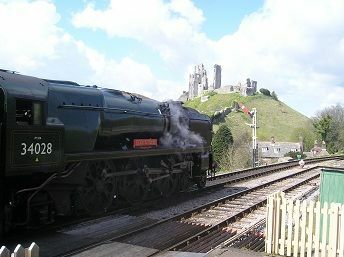 It's a nicely preserved railway with beautiful views of Corfe Castle, though like the majority of preserved railways isn't long enough! It would be nice if the line could be continued through to Wareham and be connected with the national railway system. This time I was hauled both ways by West Country class, 34028, Eddystone. Went up to London to see a show in the West End. 10/5/12 Leigh-on-Sea to London Fenchurch Street and return. London Blackfriars to Sutton via Wimbledon. Sutton to Farringdon via Mitcham. Had to go to Sutton with my work, so went on the Sutton Loop or "Sutton Circle as I call it, as it is one of the few true circle services in the London area. I hadn't been on this route for about three years so it was interesting to see the "wall of Death" just before you get to Sutton from the Wimbledon direction. I caught my First Capital Connect Thameslink train at Blackfriars, so it was interesting to see the newly revamped station. Although the outside with its large glass frontage is finished, the inside is still a long way from complete. The longer platforms extend out over the Thames, but at the moment its is hidden by the sheeting. Still the train was on time and when it gets to Sutton, there must be a crew change as it waits at least five minutes before departing. 14/5/12 Leigh-on-Sea to London Fenchurch Street. London Kings Cross to Edinburgh Waverley. Edinburgh Waverley to Stirling. Stirling to Alloa. Alloa to Larbert. Larbert to Falkirk Grahamston. 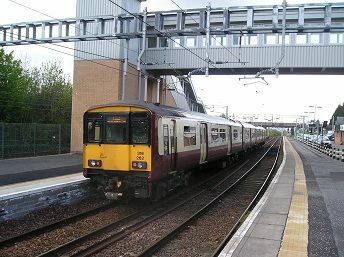 Falkirk Grahamston to Glasgow Queen Street via Stepps. Went away to Scotland for a few days, with the aim of completing the lines in the Glasgow-Edinburgh area. Got to Kings Cross in plenty of time, so had a chance to see the new departure area which has been built to the left side of the one, which I thought was always rather cramped and dingy. The new one is much larger and lighter, though the old one is still in place, but deserted now. There are also ticket barriers up in place, though when I was there they were all open and not being used.The main problem, was that there had been a person hit by a train at St Neots, so all the trains were delayed. My train, the 10 o'clock to Aberdeen didn't arrive in platform 4 until 10.15, then it was another five minutes before we got on. Then we had to wait until 10.50 before we finally departed, due to our driver coming in on another delayed train from the north. So not a very good start to my Scotland trip!By the time we got to York, we were an hour behind schedule and this stayed the same all the way to Edinburgh. This meant that my schedule was also put back by an hour. I was still able to go to Stirling and Alloa and then back to Falkirk Grahamston and onto Glasgow via Stepps. But I had to leave going on the Cathcart Circle due to lateness and tiredness. Maybe tomorrow? 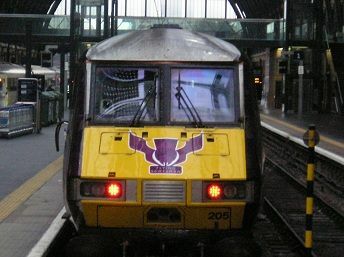 15/5/12 Glasgow Central to Carlisle via Dumfries. Carlisle to Glasgow Central. Glasgow Central to Glasgow Central via the Cathcart Circle. Glasgow Central to Whifflet. Whifflet to Cumbernauld. Cumbernauld to Motherwell. Motherwell to Uddingston. Uddingston to Bellshill. Bellshill to Haymarket. Haymarket to Airdrie. Airdrie to Edinburgh Waverley. Edinburgh Waverley to Haymarket. A not too early start, getting the 08.37 to Carlisle via Dumfries, to complete this line south of Kilmarnock. Although the train wasn't that busy, with most people getting off at Kilmarnock. The stop at Dumfries more than made up for it, with at least 50 people getting on at Dumfries, obviously going shopping in Carlisle. Although my single from Glasgow to Carlisle cost £17 going, coming back via Lockerbie was only £7, and on Virgin too! Back in Glasgow I chose to go on the Cathcart Circle, fitting it in before going to Whifflet. The connection left me with just two minutes at Glasgow Central to change trains and as it was not displayed on the departure board I missed it and had to wait another half hour for the next one. This meant that at Whifflet it would be another tight connection, with my train to Cumbernauld supposedly leaving Whifflet at the same time as my train came in. In the end my train arrived a couple of minutes before the other one, so I didn't have to wait an hour for the next one.I then went down to Motherwell and across to Uuddingston with the aim of catching an Edinburgh train via Shotts. Luckily I saw that my train to Edinburgh didn't stop at Uddingston and I was able to get the train before it to Bellshill where it did stop! Once in Edinburgh I caught a train out to Airdrie and back to cover the recently opened Bathgate route. My final day in Scotland began with a quick journey to Newcriaghall and back. Then I went on a two hour in total trip round the Fife Circle. Then it was a short hour and half break in Edinburgh, before catching the 13.30 back to Kings Cross. This time there were no problems and I arrived at Kings Cross on time. But Edinburgh Waverley is currently being refurbished and is in a bit of a mess. But so too is the centre of Edinburgh with the tram lines currently being built. After I arriving at platform 19 in the morning my London train was leaving from platform 2. You would expect that it would be right across the station from platform 19, but no, platforms 1 and 2 are on the same platforms as 19 and 20! Just different ends. Very confusing - such is the mess that Waverley is in at the moment. I look forward to coming back in the future to find a nice, ordered station sometime! PS. I wrote off to East Coast for compensation for my delayed train on 14/5/12. They said the train was 58 minutes late and not 1 hour as I reckoned, so I only got half the full fare back and it was in vouchers! 1/6/12 Leigh-on-Sea to London Fenchurch Street and return. London Euston to Birmingham New Street and return. Birmingham New Street to Redditch and return. 2/6/12 Leigh-on-Sea to London Fenchurch Street and return. London St Pancras to York via Sheffield and Doncaster and return. Went on a UK Railtours trip to the first day of the York Rail Fest. I was going to drive round the M25 round to St Albans and then take a train to Luton Airport Parkway, where the train would pick up just after 8.00am. In the end I chose to get the train into London and pick up the train at St Pancras after a tiring day going to Birmingham yesterday. It meant getting up at 5.30 am to catch the 5.50am train into Fenchurch Street to give me enough time to get to St Pancras for the 07.40 departure on an East Midlands HST. 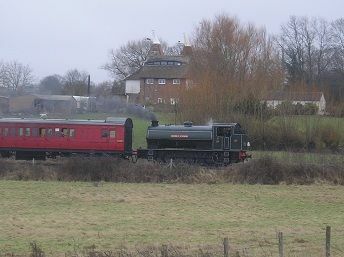 Usually with John Farrow organised trips there are one or two diversions along unusual lines, but apart from a route along the Erewash Valley line past Toton, the route stuck to Sheffield and Doncaster. Several of us were hoping we might go via Castleford and Church Fenton, but it wasn't to be. We arrived at York around 11.30 am and for most of us it was a short walk across the footbridge and into the Railway Museum complex. They had a similar event here in 2004 which celebrated the bicentennial of the first railway, though I am not quite sure what the reason for this event is. However, the event brought together over 30 record-breaking locomotives and trains such as the fastest, oldest, strongest, newest, etc which meant plenty of trains of all ages to see. 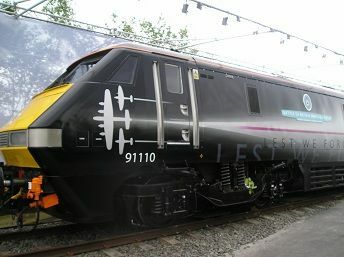 There's not enough room to describe everything, but it included steam engines like Mallard, Sir Nigel Gresley,Tornado and Duchess of Hamilton, plus diesels of classes like 20, 37, 47, 57,etc and then there was the first ever train naming ceremony I had attended. This was the naming of 91110 Battle of Britain Memorial Flight by Carol Voorderman. We even had a fly past of a Spitfire, a Hurricane and a Lancaster. It wasn't just locos though. 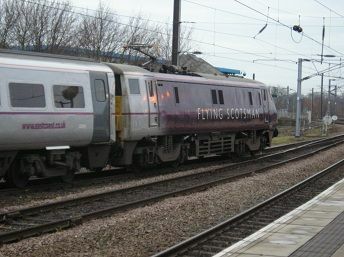 there was access to a variety of units like the Virgin Pendelino and the Class 395 Javelin unit, plus the newest British train there, the First Scotrail Class 380. There was also several free train rides you could go on, both standard and narrow guage, including being pulled by City of Truro. I forgot there was also the Flying Scotsman there in all black as well as Harry Potter's Hogwart's Express. Plus it was nice to have a pint of Flying Scotsman real ale as the planes flew overhead. So all in all a very well organised event with plenty to interest people of all ages and tastes. We left on time just after 5.00pm and were early arriving back at St Pancras. I fianlly arrived home at 10.30pm after a seventeen hour day! 16/6/12 Leigh-on-Sea to London Fenchurch Street. London Euston to Chester. Chester to Bromborough Rake. Went up to Birkenhead for a school reunion. Met up at Euston with an old school friend who used to be my train spotting partner in the 70's, so it was nice to talk about old times. For a change I went on a Voyager as I was travelling to Chester. A much more enjoyable journey without the tilting and nearly as fast. 17/6/12 Bromborough Rake to Liverpool Lime Street. James Street to Liverpool Lime Street. Liverpool Limes Street to Wigan North Western. Then travelled over to Liverpool for an explore including going on the ferry, before catching a train over to Wigan to visit some frinds in Lancashire. 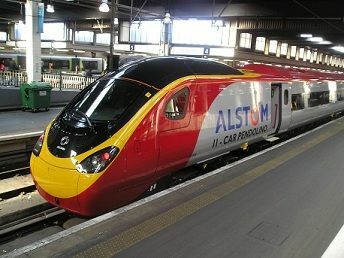 18/6/12 Manchester Piccadilly to London Euston. London Fenchurch Street to Leigh-on-Sea. Went to London to my first of three visits to the Olympics. This was for the ladies table tennis at the Excel Centre. Although it was a sunday afternoon the train was busy, as was the DLR we got from West Ham. Even at West ham there were lots of officials both from C2c and the Olympics, plus some police, some of whom travelled on the DLR with us. We left the Excel before the end so the journey wasn't as busy as going. The connection at West Ham was good, so it took us just under an hour from getting on the DLR at Prince Regent to getting off the train at Leigh-on-Sea. Incidentally Leigh-on-Sea station now has "alight here for the mountain biking at Hadleigh Farm" signs as well as various coloured Olympic banners just outside the station. All very exciting! Went to Statford for the second of my three Olympic Games visits. This time I went to the main Olympic Park to see the the Men's Hockey event where Great Britain drew 2-2 with South Africa. This time I got a Jubilee tube train from West Ham to Stratford, which was much quieter than sunday, probably because it was in the middle of the day. However at Statford train station it was very busy. 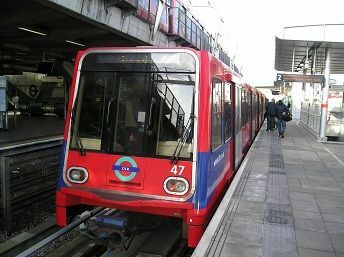 You are directed under the station going into the Olympic Park and then round the side of Westfield shopping centre. 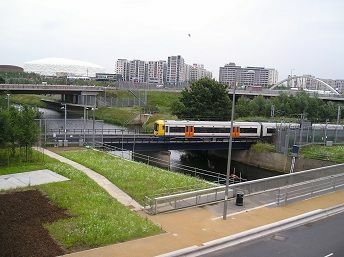 But coming out you go through Westfield and then over the station on the footbridge. The tube from Stratford to West Ham was just like the rush hour - mind you it was six o'clock in the evening! The actual Olympic Park is massive with around 100,000 people in it at any time - though next week when the Olympic Stadium is open it will be even more. Went to Stratford for the third and final time of my three olympic Games visits. This time we went in the morning rush hour, getting the 07.08 train from Leigh-on-Sea. The train was fairly full but not packed to overflowing, with a mixture of commuters and games goers. The tube from West Ham to Startford was also quite busy but not quite standing room only. Coming back at about 3.00pm there was plenty of room on both tube and train. 18/8/12 Leigh-on-Sea to London Fenchurch Street and return. London St Pancras to East Croydon. East Croydon to Fratton. Fratton to Fareham. Fareham to Havant. Havant to East Croydon. East Croydon to London St Pancras. Had to go down to Fareham with my work. Went via Kings Cross to see my wife off on her train to Kings Lynn, where she was going for the day. Then caught a Thameslink train through to East Croydon where I had a six minute wait before I caught my Southern Trains train through to Portsmouth. It is a little known train in general public terms which goes on a roundabout way from London Victoria to up to Portsmouth via Gatwick Airport and Horsham. In fact it is an 8 car train which splits at Horsham with the latter part continuing onto Bognor Regis. It is also one of the most picturesque stretches of line in England, especially in the summer as it travels along the Arun valley, and is often overlooked in favour of the Settlle & Carlisle or West Highland lines.The train I get from Fratton to Havant is another roundabout train which still goes onto Waterloo but goes on a little used branch between Fareham and Eastleigh, which is also a non-electrified line. On my way up to Northumberland for my summer holiday, we decided to spend the day at the Beamish historical museum, near Durham. It's a bit like Disney meets the Edwardians with various sites rebuilt to show the year 1919. 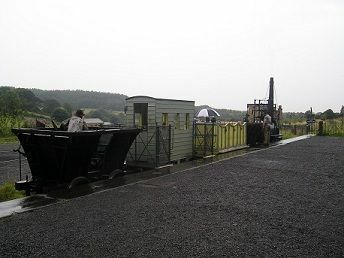 It has a railway station with a regular steam train service. The only problem it only goes ¼ of a mile before reversing back to the station. Originally it did go further into the pit village area but was cut back to make way for the tramway which goes all the way round the site. My wife and I were about to call it a day when we noticed another railway line in the distance. This one was a reconstructed waggon way with a Rocket lookalike steam engine pulling a variety of ancient looking carriages. As it was raining we went in a strange carriage which looked more like a garden shed, rather than a railway carriage! Beamish is well worth a visit if you like living history and is open all year round and is not that far from the Tanfield Railway which we went to on our return from Northumberland. As we didn't have time to go to the Tanfield Railway on the sunday we called in our way back from visiting Northumberland. It claims to be the oldest railway in the world and although it is a working railway, my impression was that it seems to be lacking in funds which some of the other preserved railways seem to have. You park near Andrews House station and then go down an old fashioned roadway to the station which has a tea room and bookshop. The train then goes north to Sunnyside where the engine turns around. Then it goes back through Andrews House station and downhill via Causey Arch to East Tanfield where the train runs round again, before going back to Andrews House. Apart from Andrews House station none of the other stations have shelters. For me it would make sense to have the trains starting at East Tanfield where there is a large car park and some sidings and then go up to Sunnyside and back. But for this to happen the railway needs quite a bit a money. Perhaps a TV show or a film company could use the railway as a place to film? 27/8/12 Leigh-on-Sea to London Fenchurch Street and return. London Marylebone to Aylesbury and return. Aylesbury to Quainton Road and return. As my wife was already going out for the day I decided to make use of my free time to visit Quainton Road station aka the Buckinghamshire Railway Centre. I knew that on bank holiday Mondays you could get a special shuttle train direct to Quainton Road from Aylesbury, which would mean new track for me and a chance to travel on some of the original Great Central Railway route.Within about two minutes of arriving at Aylesbury the shuttle train arrived on platform 1. It was a bubble car that usually runs between Aylesbury and Princes Risborough. For some reason not many people got off then I realised at the other end they had come for a train ride from Quainton Road! At Quainton Road I paid £16 for my combined train fare abd admission ticket. It was only when I got back to Aylesbury station that I saw the price was actually £14, so I was overcharged £2!!! !Apart from that, the site was much bigger than I was expecting with two different steam train rides available, as well as a miniature railway and a large carriage museum with lots of Metropolitan and GCR relics. My only gripe. was that there was only one restaurant with a long queue waiting to be served both times I visited it. It was a pity they didn't have another refreshment place say over by the museum. Also it's a shame the centre is in the middle of nowhere as I am sure it could attract more visitors if it was more accessible. Maybe Chiltern Trains could look into running trains between Aylesbury and Bletchley (or even Oxford) which would help open up this area more. 10/9/12 - Leigh-on-Sea to London Fenchurch Street and return. London Victoria to Bromley South and return. Had to visit Bromley with my work. Chose to go via Victoria as opposed to Blackfriars or London Bridge. It's a vey quick journey if you get the non-stop train to Bromley South which takes not much more than 15 minutes. However after Bromley, the train stops at every station all the way to Ashford! 4/10/12 Leigh-on-Sea to London Fenchurch Street. London Euston to Stoke-on-Trent. Stoke-on-Trent to Derby. Derby to Nottingham. Had to go up to Stoke with my work. No real problems apart from the usual requested seat on Virgin was not facing forwards. After my work I caught an East Midlands train from Stoke to Derby. As it was rush hour time, I was expecting at least a 2-car train, but in fact it was just a one carriage Class 153 Super Sprinter, which is a regular on this route. Of course the amount of people getting on the train at Stoke meant that it was standing rooom only for several of the passangers. Though by the time we got to Uttoxeter, the carriage was half full. 5/10/12 Nottingham to London St Pancras. London Fenchurch Street to Leigh-on-Sea. Came back from Nottingham, making the train with just a couple of minutes to spare. At least East Midlands Rains had given me my requested forward facing seat, with a table in a quite carriage. The train was quite empty as we left Nottingham but was full with all the stops it makes on the way. I don't know why EMT don't let some trains from Nottingham run as express trains once in a while. It seems the Derby trains are always expresses. November was a month of "commuting" up to London and back from Essex, with no other railway journeys to further afield places. Had to go to Uxbridge with my work. Takes two hours via the Metroploitan line but it s a staright through journey from Aldgate on the new(ish) S8 Stock. Coming back from Fenchurch Street I caught the 15.25 which is a rare working as it only goes to Leigh-on-Sea, coming in on the rarely-used latform 2 at Leigh-on-Sea station. Went to London for the evening to a concert at Hammersmith. As there was engineering work on the line between Barking and Fenchurch Street after 20.00, we decided to go from Rayleigh into Liverpool Street. A big mistake. Going was fine, but coming back the train we should have caught was cancelled and we were told to take a slow, stopping at every station train to Shenfield and then change there. If we had been told to take the first fast train to Shenfield, I am sure we could have saved half an hour of travelling time. I did write and complain to Greater Anglia who did refund me part of the train fare. Went to London for a meeting, getting off at West Ham to go on the DLR, which I love for its driverless trains. Exactly two weeks later, my wife and I went to London for the evening to another concert - this time at the Royal Albert Hall. Luckily there were no engineering works on the c2c line and both journeys went OK. Went up to London for another evening visit. This time coming home I had to put up with a drunk person walking up and down the carriage. Pity they don't have stewards on these late night trains. Had to go up to Newcastle with my work. Although it had been very wet the week before with parts of the ECML flooded, the journey up was pretty uneventful. We did have to slow north of Darlington where it looked like a speed restriction where the fields were flooded either side of the line. As we were already late, we arrived into Newcastle about fifteen minutes late. 4/12/12 Newcastle to London Kings Cross. London Fenchurch Street to Leigh-on-Sea. Returned home the next day without any problems. My final train journey of 2012 was specially to go on the little use track between Bow Junction and Gas Factory Junction. This was because c2c were running some special "Shoppers Trains" taking passengers to Stratford's Westfield Shopping Centre on the two weekends before Christmas and the one after. This is similar to a service they run in Scotland to take shoppers into Glasgow during the same period. The trains left the LTS line at Barking and then went via Stratford before getting back onto the c2c line via a hardly ever used piece of track that joins the Great Eastern and LTS lines, west of Stratford. Due to enginnering works at Benfleet station where the bridge was being replaced, I drove to Laindon rather than getting a bus between Leigh-on-Sea and Pitsea. My train, the 12.49 was 8-cars long but virtually empty. A few passengers did get on at Barking who obviously knew about it, so that at Stratford about 50 passengers did get off. Coming back only a handful got on at Stratford. Perhaps the engineerring work put potential users off, though perhaps before Christmas this service might have been more popular. Also I only found out about it when I logged onto the C2c website to check train times before Christmas. So perhaps more publicity was needed? It was a brave idea to use this route, though as someone who went to the Olympic Park a couple of times during the Olympics, I would have welcomed this route being use then. I presume they didn't due to the regular commuters who wouldn't like having to arrive at Fenchurch Street ten minutes later than normal. Plus I suppose on a normal weekday rush hour Stratford station wouldn't have the capacity to cope with these extra half-hourly trains.